All these years later, it's easy to forget just how successful some '80s bands were. There's a tendency to dwell on the couple of massive hits and forget that, sometimes, there were lots of medium-sized hits as well. That's certainly the case with the band behind one of the new entries on the ARIA singles chart this week in 1986. British duo Eurythmics had an incredibly consistent run on the top 50 throughout the decade, notching up 15 top 20 singles. But how many have you forgotten about? A singer with more hits than she's often given credit for took over at number 1 this week in 1986. "Touch Me (I Want Your Body)" by Samantha Fox dethroned "Addicted To Love" for the first of three non-consecutive weeks at the top. After the unprecedented top 30 hit that was "Just Like Fire Would", The Saints returned to the fringes of popular music with this second single from All Fools Day. Kicked out of Bow Wow Wow as the new wave band self-destructed, Annabella Lwin embarked on a solo career with a cover of the Little Willie John standard. We saw their highest charting single, "No Tragedy", on my recap of the first ever ARIA chart but The Radiators seemed to have run out of steam by 1986. I'm a little confused about what was going on with the band's record deals at this point in time. Their two previous albums had been released by EMI and their upcoming 1987 album, Nasty Habits In Nice Children, was their first (and only) through their new deal with Mercury (a Polygram label). So far, so straightforward. Here's the complicating factor - even though it was included on Nasty Habits..., "One Touch" came out through RCA (which at this point in time was distributed by Warner Bros). 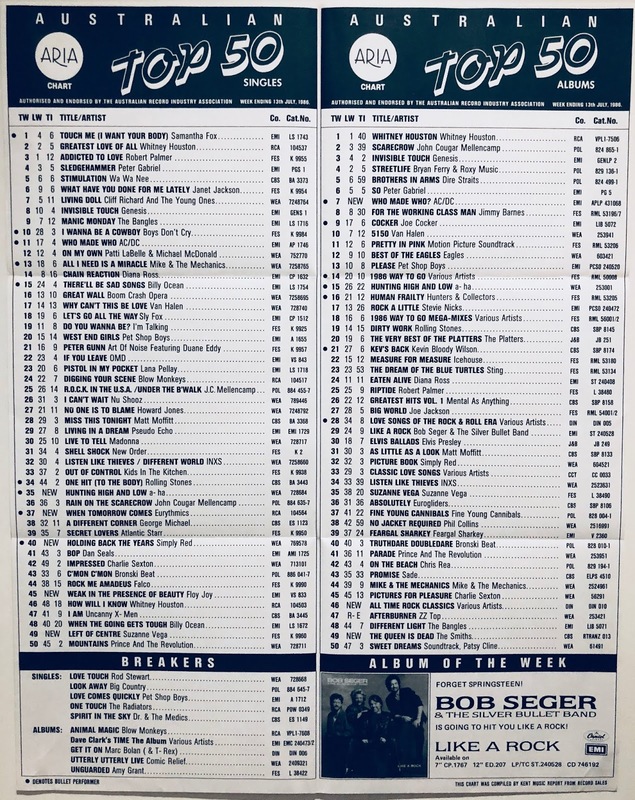 Whatever the reason for The Radiators bouncing around record companies, it didn't help them get back inside the top 50 with a song that probably should have. "West End Girls" was spending its 12th and final week in the top 20, but this follow-up could do no better than getting to number 54 - twice. "Love Comes Quickly" spent 10 weeks bouncing around between numbers 51 and 70, settling at its peak position on two separate occasions. Its almost as if people wanted to like the song, since its predecessor had been so popular, but it never quite got there. That's a pretty good summary of how I feel about "Love Comes Quickly" - it's a nice enough song with a fun, innuendo-laden title, but it's always seemed like an odd choice of single in the wake of "West End Girls". A few weeks ago we saw two new entries from Pretty In Pink hit the chart - and this week, a third track from the soundtrack album joined "Shellshock" and "If You Leave" in the top 50. "Left Of Center" became a second minor hit for Suzanne Vega following the recent re-release of "Marlene On The Wall", which had just finished a nine-week stint bubbling around the 40s. This track, which featured Joe Jackson on piano, did marginally better and no doubt helped Pretty In Pink edge ever closer to the top 10 (it would end up peaking at number 6). For some reason, I wasn't aware this original version of the track later covered by Alison Moyet had been successful in Australia. But, it actually did much better here than in the UK (where it tanked at number 85) and even peaked one place higher on the ARIA chart than Alison's remake (a UK number 6 in 1987). A song I've always found a little tedious no matter who's performing it, "Weak In The Presence Of Beauty" was the first single from the third incarnation of Floy Joy. The group had already been through two female singers before former backing vocalist Desi Campbell stepped up to the main mic. Another popular song I find a bit snooze-inducing is this US chart-topper from Simply Red. "Holding Back The Years" had initially reached a disappointing number 51 in the UK and had fallen out of the ARIA top 100 after peaking at number 87, but the ballad's success in America prompted a renewed push in both countries. 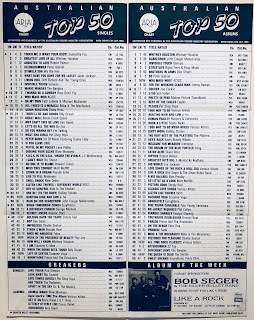 Reissued in Britain, it ended up going as far as number 2, while in Australia, the single re-entered the chart and made its way into the top 20. Their first two hits had both featured in the top half of the first ARIA chart exactly three years earlier, and Eurythmics hadn't put a foot wrong in the years since, only missing the top 20 with previous single "It's Alright (Baby's Coming Back)" - and to be fair, that had been the fourth release from a chart-topping album (Be Yourself Tonight). Order was restored as this lead single from Revenge sailed into the top 10. Musically, "When Tomorrow Comes" was a return to the rockier sound heard on "Would I Lie To You?" - a style that defined Revenge. Annie Lennox and Dave Stewart were even decked out in matching leather jackets for the occasion. More hits were to come, with the duo maintaining their top 20 strike rate until early 1988. A-ha had kicked off their first concert tour in Australia in June 1986, so it's little surprise the title track of their debut album received a warmer reception on the ARIA chart than previous single "Train Of Thought". It might have helped that "Hunting High And Low" is also a much better song. Significantly remixed from the album version, the dramatic ballad was a change of pace from the trio's three hits so far, made even more effective thanks to the presence of an orchestra on the track. Just beautiful. Next week: Madonna returns with another new single - and another new look, plus a hit remake of a song that had topped the Australian chart in 1970. Never heard the Latin Quarter song before, but it's nice. Not knowing the song before I bought 'Discography', I always used to skip 'Love Comes Quickly', thinking it was boring, but I like it now. The pulsing synth verses are the highlight for me; I'm less fond of Neil's falsetto parts (which I didn't realise was him until I saw the video). There is something about the song that doesn't seem very 'them', though. I love 'Left of Center', but it doesn't have enough happening in the second half and could have finished earlier. I mentally placed 'Holding Back the Years' earlier in the year (if not late 1985) than July; though I guess it was re-released. Given 'When Tomorrow Comes'' success in Australia, it seems shocking that it barely dented the top 30 in the UK. 'Hunting High and Low''s debut seems like a very rapid follow-up to 'Train of Thought' (unless that took a while to reach the top 50?). Eurythmics were brilliant and you're right, Gavin - it's easy for people to forget that they had a huge number of hits in Australia. How much like Marie from Roxette does Annie look in the opening sections of the video (where her face is covered)? It could easily have been her. I loved most of what they did up until the later singles from "We Too Are One". Their 1999 reunion single ("I Saved the World Today") was also brilliant. I have often thought Marie from Roxette looked very much like Annie in 'When Tomorrow Comes'. Must be the bleached, cropped hair and leather trenchcoat thing they both had going on. Yes, it's now on YouTube. I added a link but forgot to update the blurb. All done now.